VeePN has gained lots of popularity as it offers some exciting features and fast servers. The VeePN offers unlimited bandwidth with no speed caps or throttling, several servers in many countries on all continents, the impenetrable 256-bit encryption, no log policy and kill switch. VeePN also offers custom software for all major devices and platforms. It is available for Android, Windows, macOS, Linux, iOS, and Wi-Fi routers. Additionally, you can also install VeePN as a web extension for Chrome, Firefox, and Opera. You can connect up to 10 devices under the single subscription plan. 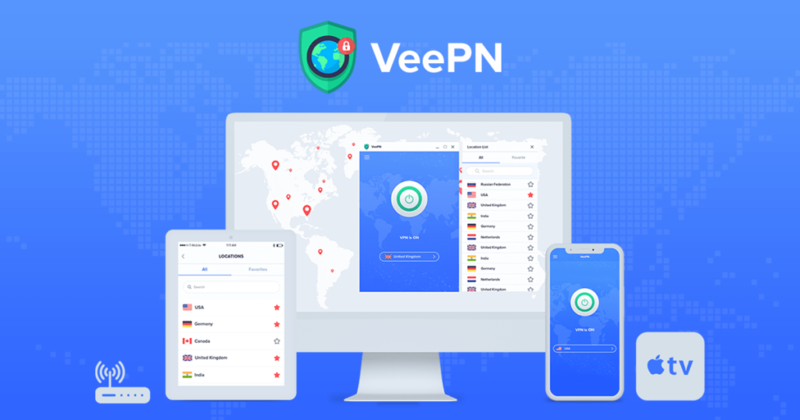 There are 2500+ VPN servers in more than 48 locations that are privately held by VeePN service, which provides you the fastest service possible without traffic limits, throttling and restrictions. The service offers Smart VeePN that allows you to surpass any geo-restrictions that were not possible with other protocols before. For example, most American television channels are only available in the US. VeePN removes the restrictions and allows you to access all the blocked websites. It works with Netflix as well. VPN locks down all data with impenetrable 256-bit encryption, the automatic public Wi-Fi security, and the Kill Switch. VeePN uses OpenVPN and IKEv2 protocols so no one who is trying to sniff at your data and browsing session will be able to hijack your information successfully. One of the best features provided by VeePN is Kill Switch protection. If your VPN connection drops, your IP can be exposed for a little while. You want to make sure your computer doesn’t bypass your VPN and connect directly to your ISP. Fortunately, Kill switch will force the applications to connect to the Internet only via the VPN. VeePN follows a strict No Logs policy, which means the service does not retain any of your personal information or browsing activity. This means that when a connection session ends, your browsing history, location, and IP are lost forever. Also, it offers you full protection to shield both your traffic and your DNS queries from being exposed. VeePN offers their services at a very reasonable price, which are worth every penny. It also offers free service for 7 days and a 30-day money back guarantee. At this price, VeePN provides unlimited data usage and the ability to connect up to 10 devices simultaneously. And you can add 100 extra devices for $0.8 per device. The best thing about VeePN is that the team has made the installation process as simple as possible and offered a click & go system. Once the app is running and you’re logged in, it shows the big button to start your VPN experience and choose the best locations automatically to provide the fastest connection. You can also disconnect and choose a custom server in your favourite location. Changing servers only takes a few moments. Download VeePN Android Version and install it on your device. Open the app and Log in with your email and password. If you don’t have an account, you can create a new one right away in the app. You can see a big white button in the middle along with your current VPN connection status and a location. Tap on the button to start the VPN. The status will change from “VPN is Off” to “VPN is On”. You can also change the encryption protocol by going to app settings and then to the VPN protocol section. VeePN offers everything we could want from a VPN service: the top-security protocols to encrypt your data, access to geo-restricted content, Kill switch, and an impressive performance. Let us know what you think about their service in the comment below.